Platform Arts presents an installation of paintings by Glasgow-based artist Conor Kelly (born Cork 1980). 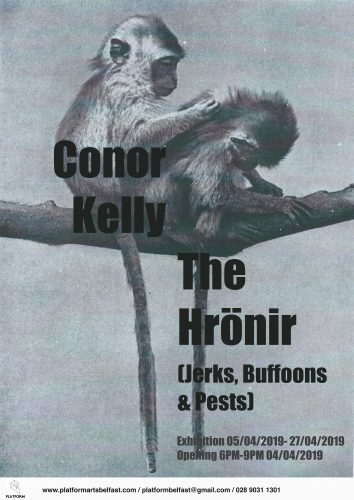 ‘The Hrönir (Buffoons, Jerks and Pests)’ is Kelly’s first solo exhibition in Northern Ireland since 2007 and brings together works that reference a variety of subjects, including sacred Balinese monkeys and the ‘satanic panic’ that spread throughout Ulster between the years 1972-74. The paintings are presented in a dressed environment commissioned specially for the gallery space. The title of the exhibition refers to the mysterious and poetic objects that appear in Jorge Luis Borges’ short story Tlön, Uqbar, Orbis Tertius. The hrönir are ’ideas, dreams and desires that are metaphorically projected onto the real world as solid, poetic objects. In recent years, Kelly’s practice has explored what he considers the ‘social life’ of painting, creating works that reference a miscellany of actors and events from natural, political and art histories. © 2019 platform arts All Rights Reserved.